Well, that is what she is claiming. Perhaps it will help her with the slacker vote. Here in Louisiana, however, the Democrat does not have a home of her own. She is registered to vote at a large bungalow in New Orleans that her parents have lived in for many decades, according to a Washington Post review of Landrieu’s federal financial disclosures and local property and voting records. 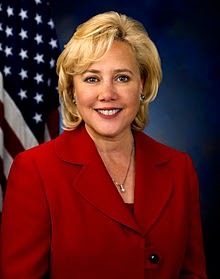 On a statement of candidacy Landrieu filed with the Federal Election Commission in January, she listed her Capitol Hill home as her address. But when qualifying for the ballot in Louisiana last week, she listed the family’s raised-basement home here on South Prieur Street. The New Orleans house, which Landrieu claims as her primary residence, is a new flash point in one of the most closely contested Senate races in the country. Republicans are considering taking legal action to question Landrieu’s residency in the state, arguing that since winning her seat in 1996 she has become a creature of Washington.